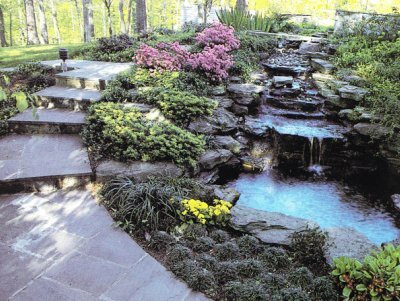 The sound of water trickeling in a brook or pouring over a waterfall, water always brings drama to a garden. According to where you build it, your water feature can be a home to the local wildlife or a formal focal point. It can be anything you want it to be. My garden feature is home to lots of local critters, and of course Mr. and Mrs."Loud Mouth" Frog and Mr.and Mrs."Laid Back" Turtle. The birds love it too. They love to bathe in the water and take a drink of the nice cool water. In the summer, it is a cool place for you and your family and a place to entertain your friends. It can be formal or have a more natural look. I'm sure you've guessed which one mine is. Decorative ponds can be made out of almost anthing. For example, a galvenized trough, a claw footed bathtub, a sink, even an old wheelbarrow. Anything that will hold water will work. They can be as small or as large as you want them to be. It really depends on how much time and money that you want to devote to it. Remember, it's whatever makes you happy. 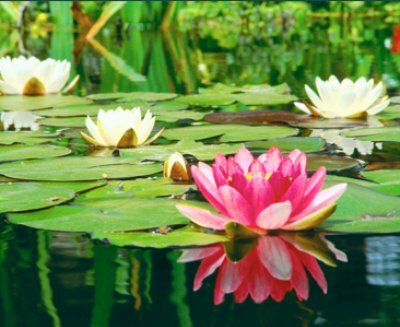 I love to garden on land, so gardening in water just came naturally to me. Just as it will for you. 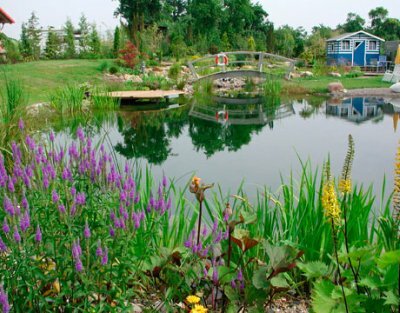 Pond gardening will allow you to grow plants that won't grow on land, like water lillies and cattails. I also take care of a 55 gallon aquarium in my house, but taking care of the fish in my pond has been quite an adventure. I mean that in a good way, as you will see when you check out my plants and fish page. Plants and Fish require special attention. Most plants need 4-6 hours of sunlight and your fish will need plenty of shade, so choosing the right spot will take a little planning. I don't have any small children around my house, but when making your plans for your water feature, safety needs to be a big concern. My main concern was all the trees that I have in my yard. To many trees can be a real problem. After a few days of thinking, planning, and moving things around, i finally found the perfect spot. As I've said, I personally like the informal, more natural style. I have no square corners. The shape has a very flexible, fluid feeling to it. 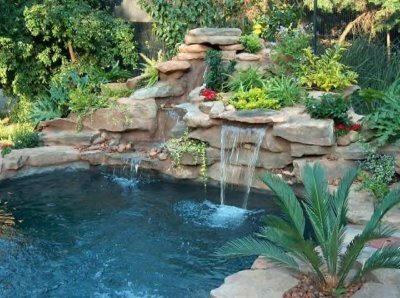 You can use all kinds of rocks and ferns around your pond. I like to develope lots of lush plant areas. It's easy to get started. Remember don't get to big, because you will want to keep everything manageable. You can always make it bigger. Unless, you have someone to help you, if not, that would be another reason why you might want to start small. It is so relaxing to sit and listen to the water as it bubbles and pops, and to watch the goldfish swim up, down, and around all the rocks and plants. The sights and sounds of all this wonder is hypnotizing. 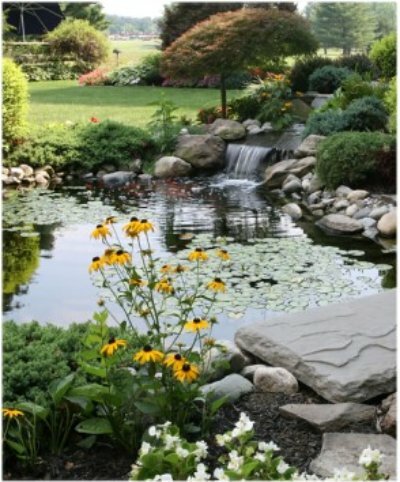 You are going to love having a garden pond as a piece of your "Garden Art".